Use seasonal confetti to make a timely homemade gift for someone special. This is way too simple but it looks very nice. When the candle is lit, the leaves shine forming a glow. 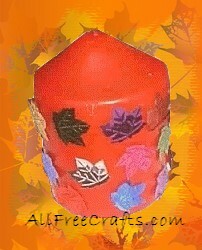 Glue on your confetti leaves all around the candle in different directions. Let dry and you are done. This is one of the easiest gifts to make, but it sure to be appreciated as a homemade gift from your kids to their babysitter, grandma or teacher. Enjoy! Make this a seasonal tradition – in spring, choose a yellow candle and decorate with Easter confetti; in summer, flowered confetti; in fall, pumpkin confetti or cornucopias; in winter – what else but Christmas confetti! Never leave a candle unattended. Never allow children to light candles without adult supervision. Cut the wick to 1/4 inch for optimal burning. Never use a candle near flammable objects or anywhere where there is danger of something catching fire. Remember to use common sense, and that you light candles at your own risk. Practice safety first!